This is one episode from Shaboom! I developed the series and directed the fifteen episodes, with 120 minutes of footage. Its first season has over two million views. Here’s this episode’s story reel. 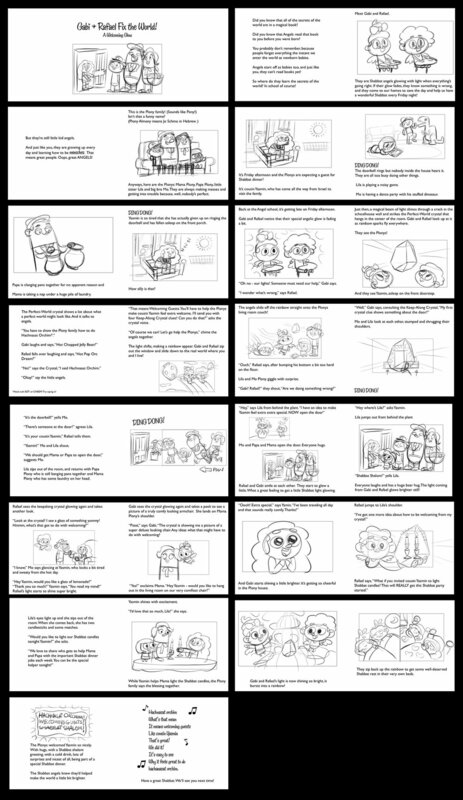 I directed the actors, edited together their lines, managed Steven Knudsen who illustrated the boards, and then edited together this final cut before sending it off to the animation team. Here’s a peak into how this show came to be. I wasn’t involved with the show’s first incarnation, “The Palace in Time.” Here’s some art from that period. 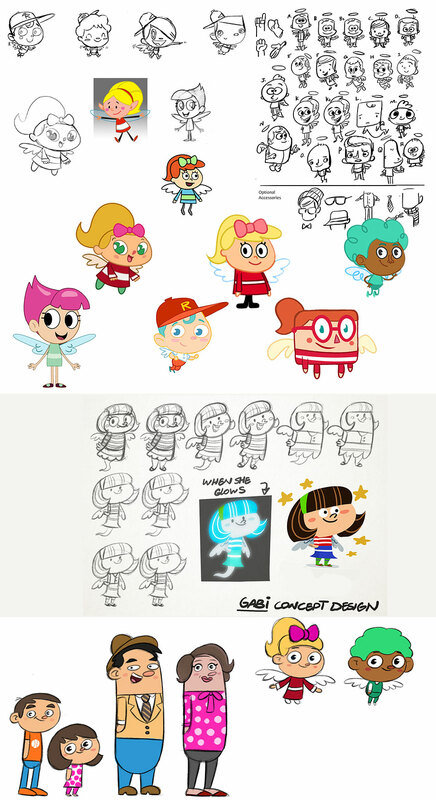 Despite already having a theme song, some character animation tests and lots of art completed, the funder decided they didn’t want to back this because of its ‘Princess theme,’ so I was brought on to help reimagine what the show could be from the ground up. We (Sarah Lefton and I) spent a while working on the initial story and finding a writer, but I’m going to focus on the visual side of production as its more fun to look at. Once we decided who the main characters would be, I had some illustrators do their takes. And from there, I chose one and made a pitch book with the final character art. Art here is by Arash Rod. With this book and some other art in hand, we went back to the funder, and this time around they approved. The show was green lit! Due to timing, Arash had to drop out, so I hired Steven Knudsen and he came up with this new set of characters. Very early in the process, I had a bunch of illustrators mock up potential background styles. I ended up going with the bottom right person, Giada Strinati, and she started whipping out incredible backgrounds. Meanwhile, I also needed to find my animation team. I had a project the previous year that had 12 two minute pieces, and decided to test animators by having a different one do each piece. Ultimately it all started with a five second animation test, before going forward with which ones to animate the full two minutes. Here are some of those five second tests, going from bad ones to good ones. And then here’s 30 seconds worth of clips from those final pieces. Obviously, there’s a huge range of style within this. The best piece was created by an animation house, Regh Animation, in India. I’d never set out to work out with a foreign animation team, but I can’t argue with the quality of their results. From the very beginning, what they’ve pulled together has been absolutely incredible. On the pilot, we spent a long time developing the story reel. Robert Pincombe coming in as the writer was absolutely game changing to the project, transforming its quality level once again. Here’s a short clip of its evolution from me doing the voices to its final version. How much time do you have? Want to learn about the actor selection process? The writing process? The educational evaluation side? The schedules? The budgets? Let me show you a few more screens that I was often working with, and then let’s talk in person if you’re really curious about anything else. Once we recorded the actors, I’d edit together a radio play version in Logic Pro. It looked like this. 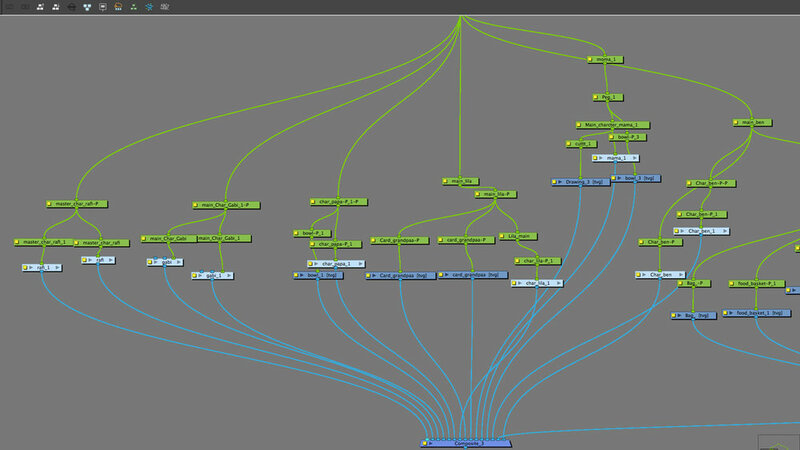 And then did a bunch of round tripping between that and Final Cut Pro, where I assembled the final animated scenes. Sometimes I’d have to go into the Harmony Files. I, admittedly, only know Harmony well enough to adjust a little bit here or there. A mouth position. An eye dart. Just enough to make the jokes land, when needed. Regh Animation requested that we work in this program, I agreed, and then had to teach myself it a little bit in order to make this all work. Here’s a peak at Harmony. Rinse. Repeat. My full schedule, including a few other projects I was juggling, looked like this. Each row represents a video. You can click to see that in another window, or here’s a zoom in, as obviously that image above is impossible to make out. I do the tasks in yellow. People often ask what my role is in directing a project. On this series I didn’t write it, illustrate it, animate it, score it, or even add in the sound effects, so what did I do? 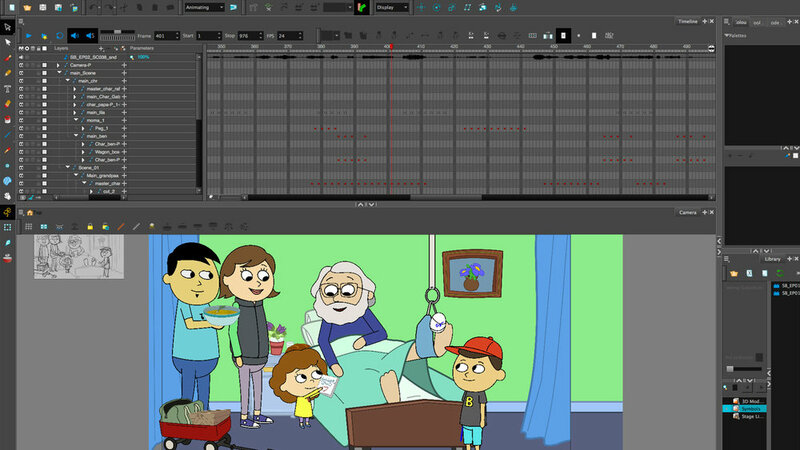 Beyond juggling the budgets and schedule, I do a lot of editing at all stages of production (script notes, animation tweaks, editing the animatic, and final assembly, etc.) and a lot of legwork at the beginning to make sure we have the right team. I hope this breakdown helped give you a better window into my directing world.